I had been looking for the Asana yogurt for a while now… went to THREE more stores yesterday before finally finding it at a store I never stop at – Quality Foods. I just can’t believe how many stores I checked before hand that didn’t sell it. The same goes for the Tenderflake Easy Pie/Crumble Kit – apparently only WalMart sells it. Kind of annoying – and they only had the crumble version. :( I found the Olivieri Whole Grain and the Pure KRAFT Refrigerated Salad Dressing at Save On Foods. All of these free product coupons were available through offers on Facebook – except the Kraft dressing one it came in the sample box. And they are all no longer available. 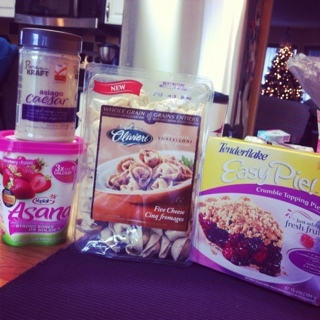 This entry was posted in canadian coupons, food, free, free product coupon, freebies, save on foods, walmart and tagged canadian coupons, free, free coupon, free product coupon, freebies, quality foods, save on foods, walmart on December 12, 2011 by Courtnie.